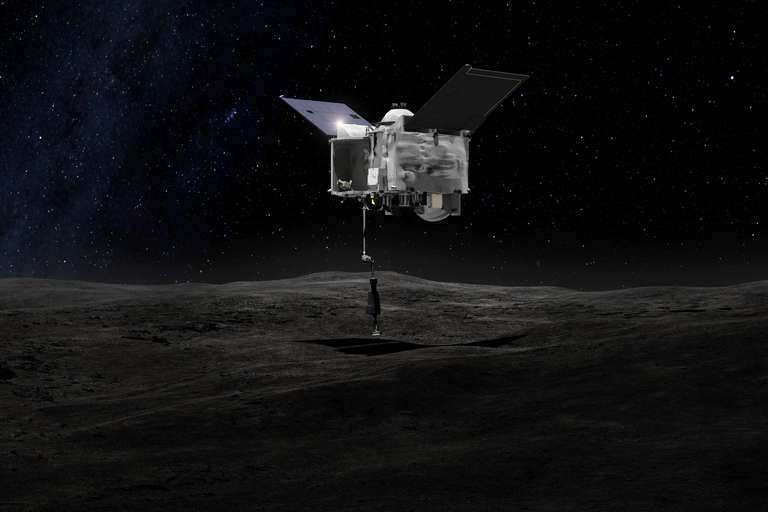 The OSIRIS-Rex mission is preparing to retrieve material from the asteroid Bennu using a special robotic arm. N	N	ASA has an asteroid hunter ready to snag precious cargo from the surface of a space rock. Named after an Egyptian deity of the afterlife, OSIRIS-REx (Origins, Spectral Interpretation, Resource Identification, Security, Regolith Explorer) will make its first approach by asteroid Bennu on Dec. 3. Riding onboard is a special robotic arm built by Lockheed Martin that will collect samples from the asteroid in mid-2020. The ultimate goal is to gather 60 grams of material through a special scoop-and-stoop procedure that will see the spacecraft passing just above the asteroid with its arm extended toward the ground. Scientists are very interested in asteroids because these space rocks represent what the solar system used to look like, before planets and moons grew from the accumulated dust and gas scattered around our solar system. With 60 grams of material available, the plan is to give out some of it to scientists in different labs, affording diverse views of the asteroid material. The inspiration for the arm first came to Lockheed flight system design engineer Jim Harris, who built the arm prototype in his garage a decade ago and tested it by picking up gravel on his driveway. From there, the prototype evolved into a sophisticated instrument that is already flexing its muscles in space as it approaches Bennu. OSIRIS-REx, which was also built by Lockheed Martin, will spend more than a year carefully mapping Bennu. Scientists will learn about the asteroid’s gravity and topography through pictures and lidar, a sort of radar that uses laser ranging or imaging. After surveying the asteroid, the landing team will select a touchdown site for the arm to scoop up material. “We’re looking for something like a sandy beach with pebbles on it, something without large obstructions or large boulders,” said Estelle Church, Lockheed Martin’s deputy led of the spacecraft arm, which is called TAGSAM (Touch and Go Sample Acquisition Mechanism). The ideal landing site will have a clear zone at least 25 meters (82 feet) in radius, with rocks no more than two centimeters (0.7 inches) in diameter. “We need a fairly large TAGSAM site because we don’t know exactly where we’re going to land in it, and we need to have rocks that are the right size for the sample,” Church explained in an interview with Seeker. When the time is right, the spacecraft will make its approach to Bennu with the arm extended. As the arm touches the surface, a nitrogen gas mechanism will fire to kick up dust. Dust should then stick to a sample “head” that’s attached to the arm. The arm includes a pogo-stick mechanism that will push the spacecraft away from Bennu rapidly, similarly to how floating astronauts use their arms or legs to push away from a wall. The spacecraft will execute three of these touch-and-go procedures before locking up the sample and heading back to Earth, arriving sometime in 2023. It’s a little different from how Japan’s Hayabusa2 will pick up asteroid material at Itokawa in 2020. That mission will use a sampling horn that picks up material after the spacecraft fires a bullet into the surface to stir up the particles, Church said. While TAGSAM’s starring role won’t come for a couple of years, Church’s team wants to make sure that the arm is ready. In late October, it successfully tried moving the arm for the first time in space. The next big step is scheduled for Wednesday (Nov. 14), when the arm’s full capabilities for motion and imaging will be tested. Church called the test “a very significant and exciting milestone for Lockheed Martin.” Of course, if the arm works as planned, it will also be an important milestone for NASA. This mission is the first time the agency will have its own asteroid sample material to examine on Earth.